Optogenetics study identifies neurons important for induction of natural REM sleep. Researchers at Massachusetts General Hospital (MGH) and Massachusetts Institute of Technology (MIT) have added another piece to the complex puzzle of how the brain controls one of the most essential functions, sleep. The researchers state that activation of cholinergic neurons, those that release the neurotransmitter acetylcholine, in two brain stem structures was able to induce REM (rapid-eye movement) sleep in an animal model. Better understanding of brain mechanisms that control different sleep states is essential for the treatment of sleep disorders. The opensource study is published in the journal PNAS. The team explain that sleep is crucial for survival and maintenance of health, and sleep disorders impair many brain and body functions, such as complex thinking, the immune system and memory consolidation. Natural sleep is composed of alternating cycles of non-REM and REM sleep, each of which provide different benefits. Current sleep aids do not effectively restore normal sleep physiology or timing and as a result do not fulfill the important functions of natural sleep. To develop new strategies for reproducing natural sleep, we need to understand the control of each component individually and in combination. Several previous animal studies have suggested that cholinergic neurons in two areas of the brain stem, the laterodorsal tegementum (LDT) and the pedunculopontine tegmentum (PPT), have important roles in REM sleep, but other investigations have had conflicting results. Both the LDT and PPT have populations of neurons that release neurotransmitters other than acetylcholine, some of which also are active during REM sleep. So to get a more precise picture of the role of cholinergic neurons in REM sleep, the investigators used optogenetics, a method of activating specific populations of neurons by means of light. In experiments with mice genetically engineered to express a light-responsive protein in all cholinergic neurons, the researchers found that activation during non-REM sleep of cholinergic neurons in either the LDT or the PPT increased the probability that animals would enter REM sleep. LDT or PPT activation also increased the number of REM sleep episodes but not their duration, implying that different mechanisms underlie the initiation and the maintenance of REM sleep. The team found that each stage of sleep provides different benefits, for example, deep non-REM sleep is associated with feeling rested, and REM sleep is important for learning, so improving understanding of the areas of the brain that control each sleep state is an important first step toward being able to reproduce natural sleep patterns. The team are now investigating how the cholinergic system connects with other brain regions important in non-REM sleep regulation as well. They summise that the findings have important implications not only for understanding sleep, but also for understanding how the brain controls arousal level in general. Tips of the fiber optics were localized to the top of the PPT or LDT. (A) Location of each fiber optic tip above the PPT (●) and LDT (■) is shown on coronal sections modified from the mouse brain atlas (33). Blue indicates ChR2+ mice, and red indicates ChR2− mice. (B) Vertical lines on the sagittal section show the span of the coronal sections. Coronal DAPI-stained sections show representative tracts over the PPT (C) and LDT (D) left by 1′-dioctadecyl-3,3,3′,3′-tetramethylindocarbocyanine perchlorate (DiI; pink)–coated fiber optics. 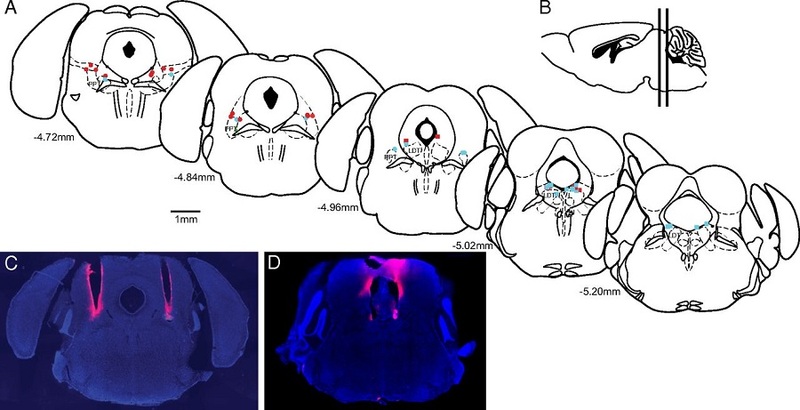 Optogenetic activation of cholinergic neurons in the PPT or LDT induces REM sleep. Brown et al 2014. In the top five of the favorite posts, thanks!